Everyone has seen chocolate yet few know where their chocolate comes from. Chocolate grows on trees! 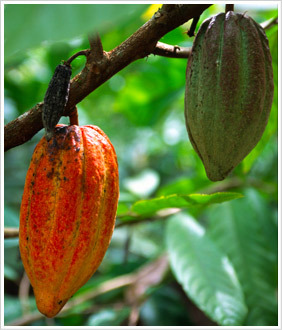 The seeds of the cacao fruit are the base of any real chocolate. While definitions vary slightly depending on who you ask, when we say "raw chocolate", we mean chocolate made at low temperatures to preserve enzymes. "Why should I care if your ingredients are all raw?" We get this question a lot and there are quite a few reasons why you should care, but to really understand we need to start at the beginning - cacao. Cacao, the basic and core ingredient of all chocolate, has some very special qualities. Named “food of the gods” over 3500 years ago, cacao was used by ancient cultures for everything from health to ritual purposes. Scientists today have found that cacao contains well over 300 nutritional compounds, which together with its delicious taste explains why raw chocolate has so many fans. Many people don’t just stop at eating raw chocolate, but add raw cacao to their smoothies, breakfasts, and even main meals! The problem is most commercial chocolate is highly processed. The cacao is chemically treated, and heated to over 130 °C so that most nutrients, enzymes, minerals, and other beneficial compounds are either lost or altered. In this process the cacao's original deep and complex taste is also changed and, often, muted. This heat affects the nutritional value of the ingredients. Most of us are aware that raw vegetables contain more enzymes and vitamins than boiled ones. The same is true of all foods, including chocolate. All this processing leads to a chocolate that is very distant from its cacao origins. At Rawr we are devoted to making chocolate with the highest quality raw, organic ingredients we can find. Completely dairy-free with no added refined cane or beet sugar, no artificial this or the other, no hydrogenated or chemical preservative nonsense, no emulsifiers, and no colourings. Guilt-free chocolate! See our comparison chart to learn more about the difference between our chocolate and most commercial chocolate. Completely raw cacao, completely yummy!